The IVA-D800R is the best companion model for the all-new PXA-H800 audio processor. Together they deliver ultra-high sound quality that will give you a good chance of winning your next sound competition. 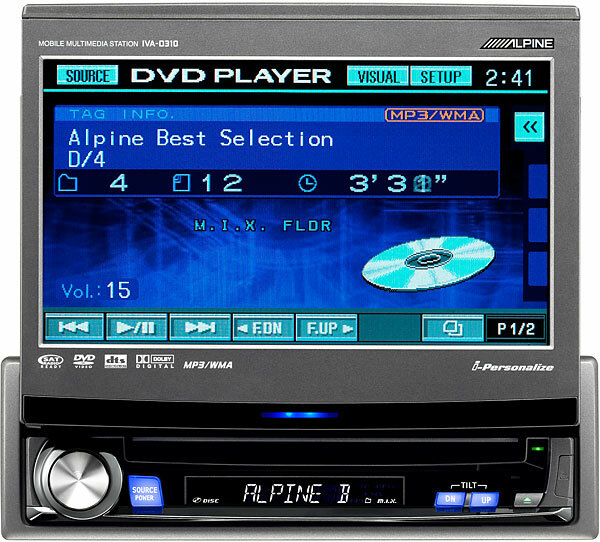 Featuring audiophile grade components, a full copper chassis for maximum shielding and countless hours of sound tuning, this is the best unit for sound enthusiasts.In addition you get excellent picture quality for watching DVD and iPod movies, as well as an easy-to-use, professional entertainment center for daily use. Alpine's advanced Micro Dynamics design concepts are fully realized through the use of the highest quality components. A specially tuned MOSFET Power IC achieves powerful, detailed musical nuances. A copper chassis, as used in the flagship AlpineF#1Status head unit, ensures that external noise is negligible. A specially selected operations amplifier and audiophile-grade capacitors and resistors maintain high quality throughout the signal path. PCOCC Preout cables reduce transmission loss and gold-plated terminals provide perfect connections. Three Preouts provide a clean signal for adding extra amps. With the IVA-D800R, you can enjoy all your music sources on the road, including iPhone and iPod, CD, DVD, radio and USB sticks. In addition, movies and videos from DVDs, iPhone and iPod will look great on the high-resolution screen. iPod and other MP3 players sound good, but not as good as the original because the data is compressed. 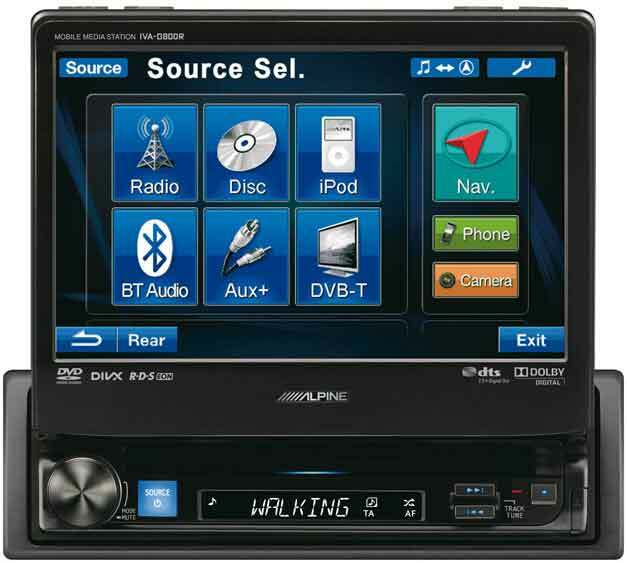 To get you much closer to that pristine sound, Alpine developed the MediaXpander. It enhances the frequency ranges where the sound is compressed, restoring the original vibrancy (Requires PXA-H100 or PXA-H800). As described on the following two pages, the PXA-H800 gives you both superb sound quality and extensive sound tuning capabilities. The IVA-D800R is the perfect model to match it with, due to its digital outputs for Dolby and DTS surround sound, and the full control capability it gives you. You can even store individual MediaXpander settings for each source, so you don't have to re-adjust each time you switch sources. If you have a Bluetooth-enabled phone, you'll want to add the KCE-400BT or KCE-250BT to your system. Compatible with many phones, they allow hands-free operation, phonebook downloading, and A2DP AV streaming (KCE-400BT). You also get the advantage of Parrot software updates for new phones. The USB port allows you to connect your USB sticks or hard discs to easily select and enjoy your entire music library. A great way to expand your system is to connect your iPod or iPhone via the KCU-451iV iPod cable (including video playback). 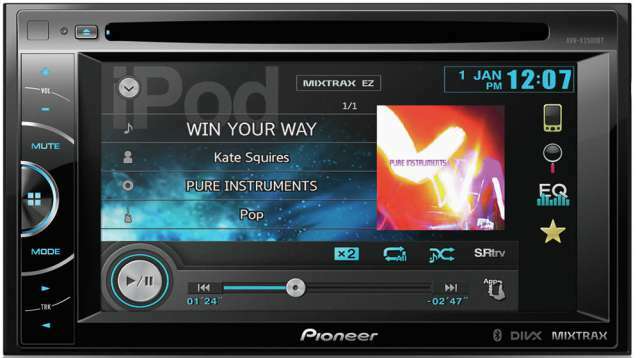 While you connect your iPod to the USB port you're also able to upgrade your Mobile Media Station with an advanced USB video interface KCE-635UB including allowing Direct Touch control. It lets you connect USB sticks and portable HDD units, provides a cool looking, easy-to-use interface to enjoy the variety of your files. Alpine KCE-400BT/-250BT Required. Features may differ between phone model and service providers. MediaXpander Modes: CD, MP3, (Level 1, 2, 3, Off), DVD Video (Level 1, 2, Off), DVD Music (Level 1, Off). Requires PXA-H100 or PXA-H800.